HP's EliteBook Folio 9470m is a well built, good looking and very comfortable to use Ultrabook, and it's also very fast. All of that good stuff comes at a high price that's perhaps typical of machines aimed at high-end business users. The HP EliteBook Folio 9470m Ultrabook has been around for a long while (we first previewed it last year), but this is the first time we've given it a thorough review and it's been worth the wait. While Intel's fourth generation CPUs are just be around the corner, leading many of you to wait until the second half of the year to consider new business machine purchases, if you can find this 14in laptop at a discounted price with a third generation Intel Core CPU, then you should definitely snap it up. The model that we're looking at here with a Core i7 CPU may be one of the most expensive Ultrabooks on the Australian market, but it's also one of the nicest to use. Its keyboard is crisp and responsive, its screen has a matte finish, and the build quality of the unit overall feels very solid. It's a business machine, of course, and for this reason it comes with Windows 8 downgrade rights, which means it has Windows 7 Pro installed instead of the newer operating system that most people either sort of like or hate with a vengeance. A chassis thickness of only 19mm makes the Folio 9470m slim, but unlike so many Ultrabooks, it doesn't compromise when it comes to built-in features. You get Gigabit Ethernet, full-sized DisplayPort, VGA, an SD card slot (the card goes all the way in and doesn't stick out) and three USB 3.0 ports along the left and right edges of the base. All these built-ins don't add much to the weight; at 1.58kg, the Folio 9470m feels light and well balanced for a 14in model. There is also a smart card reader built in (which makes this model suitable for many business environments and government departments that require this feature) and more ports can be added via the docking port. Meanwhile, there is a fingerprint reader, TPM 1.2, drive encryption software, and run-of-the-mill features such as a webcam, Bluetooth and dual-band Wi-Fi. This model also comes with integrated mobile broadband support. The right side has Gigabit Ethernet, a dock port, VGA, DisplayPort and two USB 3.0 ports and an SD card slot. The left side has the exhaust vent, a cable lock facility, USB 3.0 with sleep charging, a combination headphone and microphone port, and a smart card slot. As much as connectivity options are plentiful in this unit, so is fast performance. The configuration is headed by an Intel Core i7-3667U CPU (this was in our test machine, the machine you can buy has an even faster 3687U), which offers plenty of speed for working on media files in addition to things like spreadsheets and Web applications. It recorded 40sec in our Blender 3D rendering test, 45sec in our iTunes MP3 encoding test, and 21min 39sec in our Handbrake DVD-to-MP4 conversion test. These results are practically identical to what the similarly-configured Toshiba Portege Z930 achieved in the same tests. The EliteBook Folio is definitely a laptop that feels responsive during general usage and it's excellent for multitasking. Along with the fast CPU, you get 8GB of DDR3 SDRAM and a 256GB mSATA-based solid state drive (SSD), which recorded a read rate of 454 megabytes per second (MBps) and a write rate of 265MBps in the CrystalDiskMark test — the write rate is one of the fastest we've seen in an Ultrabook. Graphics are handled by the CPU (Intel HD 4000), which recorded 5065 in 3DMark06 — slightly slower than what the Toshiba Portege Z930 got in the same test. But they are zippy enough graphics to drive the 1366x768-pixel LCD panel and the high-resolution-capable DisplayPort if you need to use larger or dual-display set-ups. The speed is one thing, but perhaps the most impressive feature of the EliteBook Folio 9470m is its spill resistant keyboard. The keys are laid out in a chiclet style on a tray that feels rock solid. When you hit the keys they feel soft and they bounce back with a quickness that puts most other Ultrabook keyboards to shame. In short, this keyboard is perhaps one of the best, if not the best on the market for writers. The only quibbles we have with it are the half-sized up and down arrows, and the placement of the TrackPoint device. This stick can sometimes get in the way when you're aiming for the 'b', 'g' and 'h' keys because it sits slightly high (it's a concave-shaped stick, rather than a rounded stick). We should also mention that the keys are backlit by a cool white light that has two brightness levels and it's very easy on the eyes when typing at night. The Folio has one of the most comfortable keyboards of any Ultrabook that we've tested to date. Adding to the great user comfort of this laptop is a large touchpad (105x58mm), which feels silky smooth and which has soft, non-clicky left and right buttons. There are actually two sets of buttons, the second being just under the space bar for the TrackPoint. It may have gotten in the way a little while typing, but the TrackPoint can come in handy during times when you need to move the pointer but you don't want to move your hands away from the typing position. What also makes this laptop so comfortable to use is its overall build quality. It just feels so solidly constructed and it has a soft, rubber-like finish that makes you want to hold it. The reason for this finish is so you can carry the laptop easily without fear of it slipping out of your hands. And not only does the laptop feel solid, it also looks great. It's one of the best looking laptops on the Australian market thanks to its clean lines, silver colour and subtle status lights. The subtle status lights ensure that you won't be distracted by the power, drive and Wi-Fi lights while using this laptop at night — there is an amber colour given to the dedicated mute shortcut button above the keyboard, and this and the Wi-Fi toggle are the only other buttons you'll find apart from the power button. Incidentally, we're not fans of the power button, which is long, shallow and a little hard to press. The chassis feels solid despite having a removable battery that takes up the majority of the front-left corner of the base. It's a 52 Watt-hour battery that lasted 4hr 4min in our rundown test, in which we disable power management, enable Wi-Fi, maximise screen brightness and loop an Xvid-encoded video file, and this is a decent time for an Ultrabook of this size. HP offers a battery slice that can add more hours to the life of the Folio when it's away from an outlet, although it will make the unit feel slightly heavier and thicker overall, and it will set you back a further $289. The battery, which is at the top-left of this picture, can be removed. A battery slide can be added to the base, too. Heat wasn't much of an issue for us while using this Ultrabook during our test period, but we did test during cold weather. There is a vent located at the bottom, in the centre-rear position of the chassis. This supplies cool air to the fan and the fan then blows through the heatsink and exhaust located on the left side of the unit. 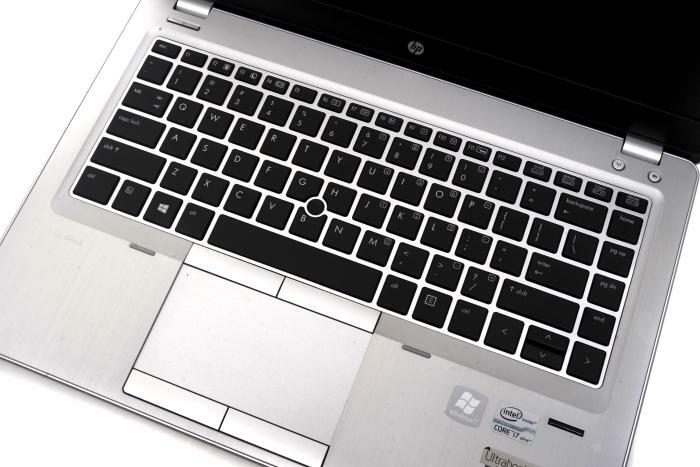 The centred vent at the bottom means that it's less likely to always be blocked when you use the Ultrabook on your lap, and the base only got slightly warm while we used the machine for typing up this review, browsing the Web and viewing photos. Noise was acceptable during our tests. While using the laptop on high performance (the same way we use every laptop during our tests), it made a constant, but not irritating whirring sound. Only when viewing full-screen photos and taxing the CPU during our benchmarks did it start to spin faster and get louder, but we don't think it got loud enough for the noise to be a hindrance when using this laptop in a meeting or other quiet work environment. It's definitely not as loud as thinner laptops that use a third generation Core i7 CPU, such as the Toshiba KIRA, for example. One area in which the Folio 9470m falls a little short is in its display. Considering the price of the unit, its 1366x768-pixel resolution just doesn't seem like its good enough for a 14in model. We would have liked an HD panel in this laptop for the price (or at least a 1600x900 panel), and also a panel with better vertical viewing angles. The screen is quite bright though and we love the matte finish, which means that reflections won't be irritating while using it with light sources behind you. Because it's a business laptop, it comes with Windows 7 Pro installed, a vPro chipset, and you also get HP's ProtectTools software. This includes a suite of applications ranging from theft recovery (Computrace) to drive encryption, and there is also a credential manager that can keep records of your passwords, fingerprints and face (for face recognition logins). There is a password manager as well, which can be used to store your passwords for frequently-visited Web sites and allow you sign on with one of your saved credentials, but it only worked with Internet Explorer during our tests (it couldn't detect login screens through Firefox and Chrome). It's fair to say that not many people would pay over $3000 for an Ultrabook, but unless you need the extra speed and capacity, and can do without the integrated broadband, then you could go for the $2249 model, which comes with a Core i5 CPU, 4GB of RAM and a 128GB SSD. It'll still be swift for most tasks, and you'll be getting an Ultrabook that is a pleasure to use while at the same time light and easy to carry on a daily basis. 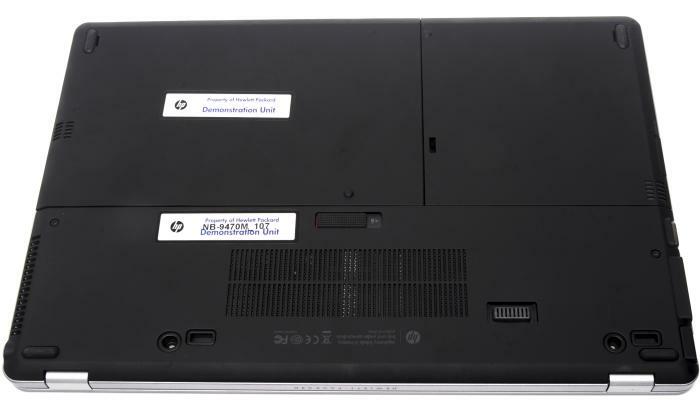 HP supports it with a 3-year on-site warranty (the battery gets one year).